The arrival of the Apple iPhone 6 is a big event on the mobile phone market and it has the immediate effect of stirring the place since it’s such a big launch. However, with every passing year, competition to Apple’s iPhone intensifies from all sides. This year, Apple has given in to the desires of many people for a larger screen and has equipped the iPhone 6 with a 4.7-inch display. Other companies, however, have gone even higher, and one such is LG with its G3, LG’s 5.5-inch flagship phone. Despite the difference in sizes, these two will be fighting for users attention on store shelves all throughout the Holiday season. This means that it’s time to see how they compare. The Apple iPhone has long been perceived as a device of both style and a sturdy, premium build. The iPhone 6 does not stray from this trend: it comes with a new design where looks adopt a sleek, iPad mini-like aesthetic. Gone are the sharp edges and flat sides of the last four generations of iPhones - the new iPhone 6 features rounded sides that make it a slightly better fit in the hand (but also, you can no longer sit the iPhone on its side). The aluminum iPhone is tightly put together, and every bit as premium as you’d expect. The back remains flat, though, with the Apple logo etched in the middle, and the only thing that breaks the otherwise uniform metal looks are strips of plastic that outline the antennas on the back of the iPhone. And yes, the camera protrudes out just slightly, which might annoy some people. The LG G3, on the other hand, is a plastic device, but it does not feel cheap at all. LG has treated the plastic cover with a non-glossy finish, and this way it stays clean of fingerprints. It also fakes a brushed metal look - it’s not real metal, though, but it’s hard to tell from afar. The phone is also very well put together, with a solid feel to it. Unlike the iPhone, the back is not flat, though - you have a curved back cover that goes a long way towards fitting easier in a hand. 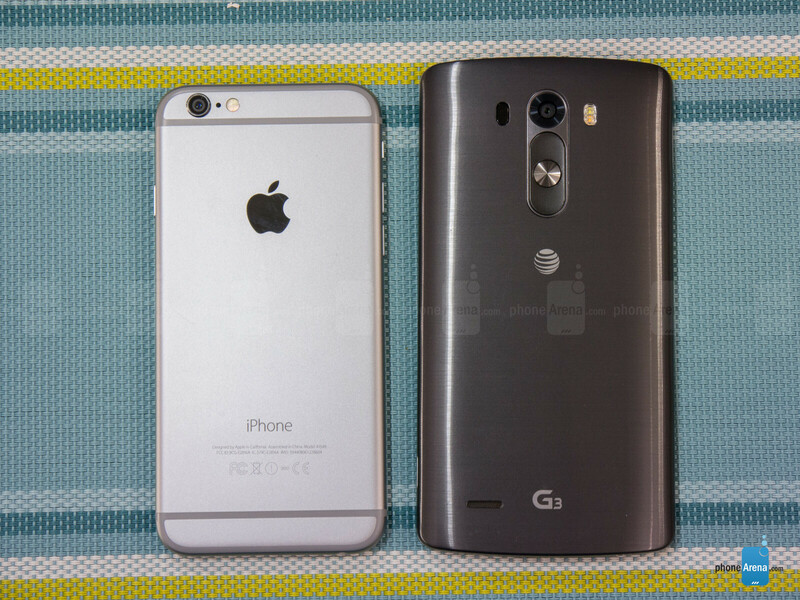 Speaking of size, the iPhone 6 with its tinier display is overall noticeably smaller, narrower, but the LG G3 is surprisingly compact for its screen size. The difference can be felt, though, and the iPhone 6 - albeit hard - can still be used single-handedly, something that is hard to say about the G3. The iPhone is also surprisingly thin, measuring just 0.27” (6.9mm), while the G3’s thickness varies, but at its thickest point it’s 0.35” (8.9mm). In terms of buttons, the iPhone 6 introduces some changes, moving the power/lock key from the top (on earlier generations) to the side. That makes it easy to reach, although the increased size. The G3 on the other hand, has no buttons on the sides and instead opts for rear-positioned keys. The power/lock key lies where your index finger resides naturally, and it’s also got a very clicky, nice feel. The lock key is encircled with two volume buttons. You can long-hold the ‘volume down’ key to quickly launch the camera app and snap away images, a nice convenience. We should also note that neither handset is water-resistant - something that might worry those who are used to seeing water-sealed devices like the Sony Xperia Z3/Z2 and Samsung’s Galaxy S5. The Apple iPhone 6 features a 4.7-inch display with a resolution of 750 x 1334 pixels, which pales in comparison to the larger, 5.5-inch screen on the LG G3 that comes with a massive 1440 x 2560-pixel Quad HD resolution. The difference in pixel density makes the contrast apparent: the iPhone 6 comes in at 326ppi, while the G3 clocks in at 538ppi. This means that the LG G3 is clearly the more detailed one. Interestingly, though, to understate the effect, LG applies some sort of an additional sharpening effect, and goes a bit overboard as images on it appear oversharpened, with a halo around some elements. Earlier iPhones have reached very high color accuracy, and the iPhone 6 packs a very accurate display, but not a perfect one. It has a slight bluish cast with greyscale color balance a bit off towards that colder tonality. Color temperature comes in slightly north of 7000K, above the 6500K reference point, which again, reiterates the colder tonality of the display. 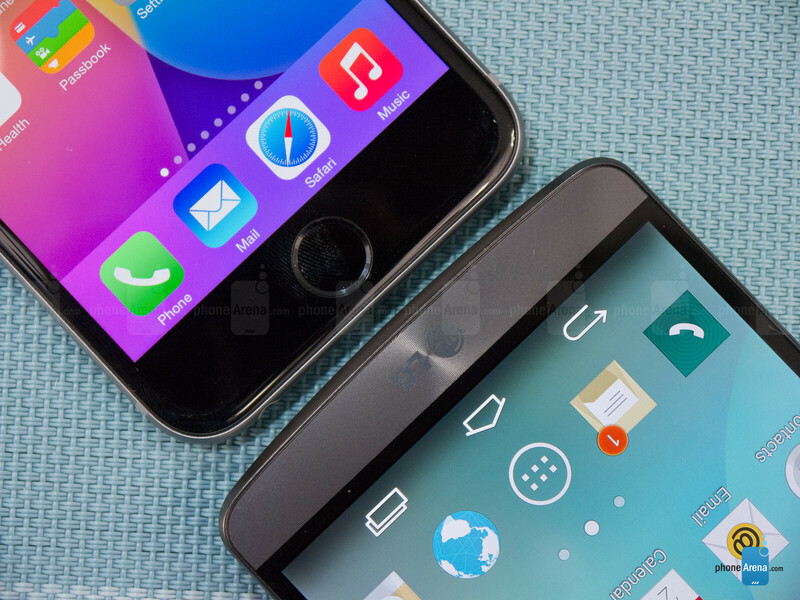 In this regard, the LG G3 is very similar - it has a slightly more imbalanced greyscale with a more pronounced blue tint. We’re glad to see both the iPhone 6 and LG G3 adhere to the industry-standard sRGB color gamut when it comes to color calibration. Color accuracy is a bit off on both phones, but still very good. The LG G3 has gone for that oversaturated look as practically all colors get an artificial saturation boost, but the hues are accurate and colors are not gaudy, as with the Samsung Galaxy S5 or Note 3. In terms of brightness, the iPhone 6 is a true champ. We measured brightness at the excellent 606 nits, significantly more than the 455 nits on the G3. This is a huge contribution to a better outdoor viewing experience on the iPhone. It also has slightly better viewing angles, preserving colors well, but the difference in viewing angles is mostly negligible. For night viewing, the iPhone 6 does a bit better as the screen can go down to 7 nits, while the LG G3’s lowest possible is 9 nits. 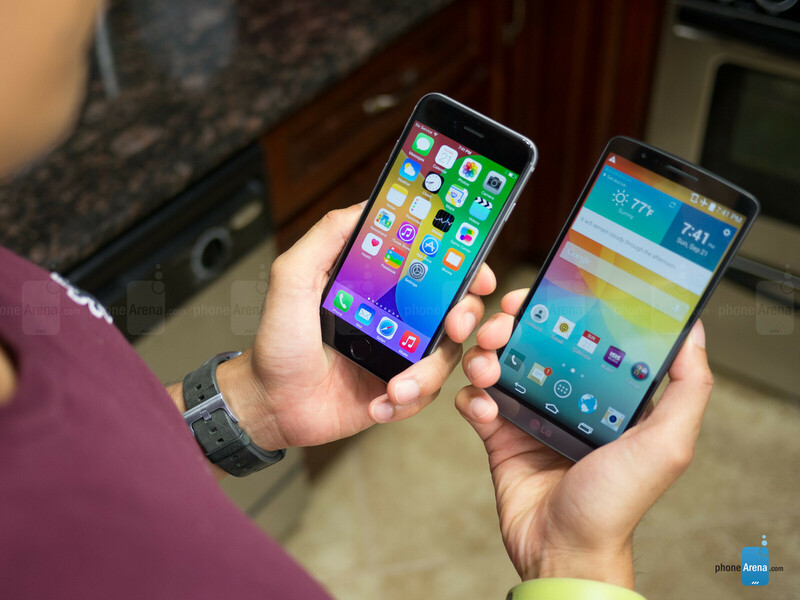 so basically the iphone 6 is better than the g3... ok i'm gonna throw up. Shouldn't the iPhone6 be compared to phones with 5 inch or smaller screens, & the iPhone6 + to phones with larger than 5 inch screens? Not that it would matter since it would still lose most of the battles anyway. They're comparing flagships to flagships. 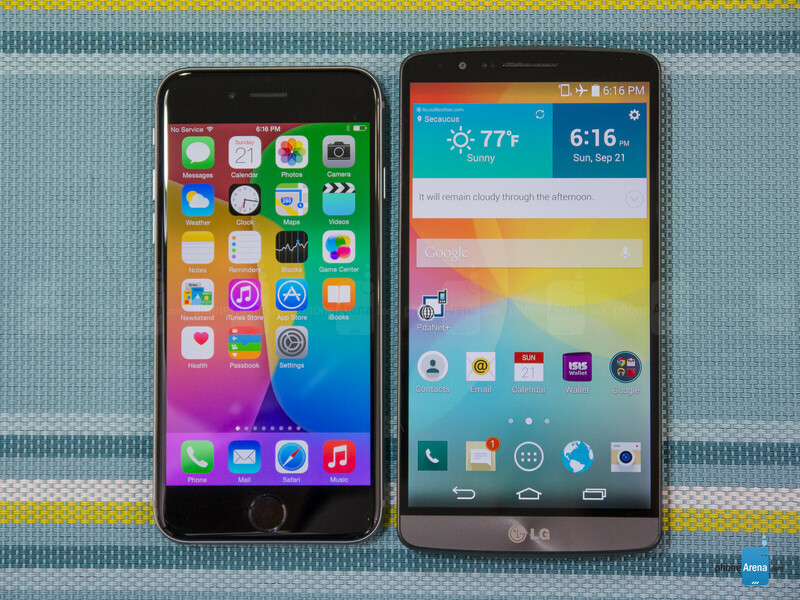 The iPhone 6+ isn't Apple's flagship, just as the Note 4 isn't Samsung's. 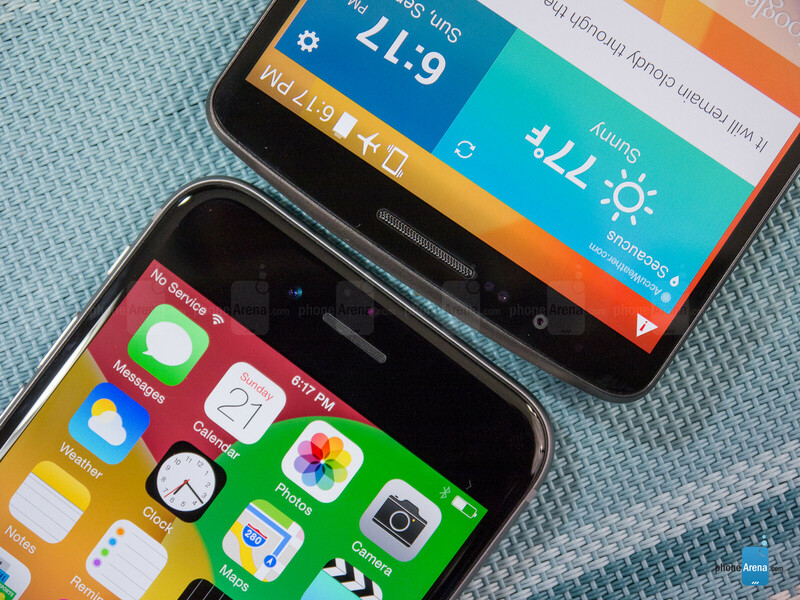 The G3 is LG's flagship device right now, as is the iPhone 6 for Apple. According to whom? Apple introduced both phones together and does a really good job of not talking about one over the other. I'm slightly confused. Why are they comparing iPhone 6 instead of the iPhone 6 Plus? Because the iPhone 6 already beats the G3. 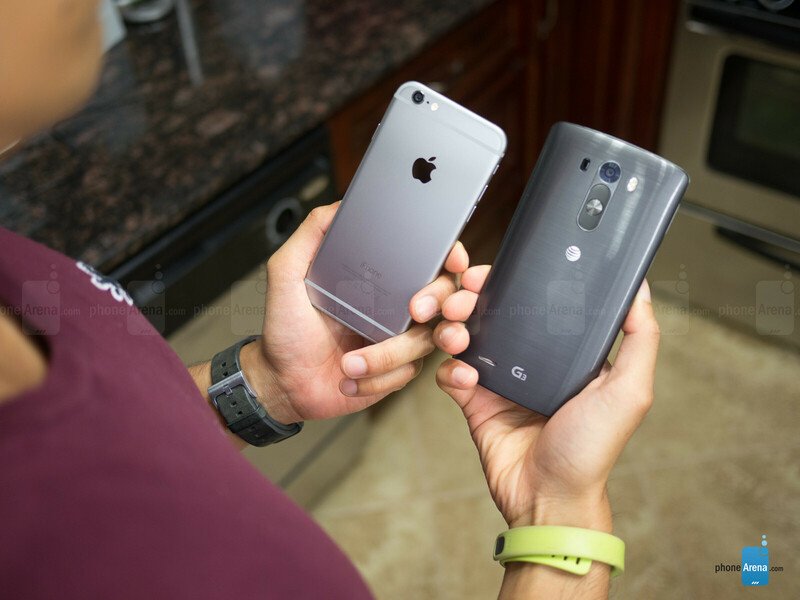 Are you blind or just a die-hard I-phone User The LG G3 IS TWICE THE PHONE! PA forgot to mention the G3 has wireless charging.. I dont get it.There is alot of difference in their battery life like approximately 50 minutes and they use the sentence "lg g3 performed SLIGHTLY better in battery part". But they dont say that iphone 6 performed slightly better than nexus 5 in battery segment which is considered to be having very bad battery performance.Because it will ruin whole reputation of iphone 6 which is rated 9 for nothing special. The whole "this phone beats this phone" thing is getting kinda overrated. People like what they like. There'll never be that ultimate phone that's better then everything else. There's always one or two thing you might not like about your "favorite" phone. It doesn't matter what apple does, for me I like using android over iOS and I'm sticking to that. Apple has nothing that I like over Android. No feature that I couldn't get from Android. I use a case for all my phones also so build material isn't that important to me. I like my big screens and being able to make my pages look like whatever I want them to look like, I like the freedom of being able to downloads apps not just from the app store. I like the fact that if I don't like the UI on the phone I can just root and unload all bloat and load up a different UI. This is baseless review(s) without common sense. How could a 5.5" screen size compares to 4.7" screen when IPhone 6+ of same screen size should have been used for same comparison. PA get your acts together I'm loosing confidence in you.